As I mentioned in my last post, all the complex corner-cases for production happen in T2 manufacturing. Where putting together the bill-of-materials was difficult due to T1/T2 linking, the "build kit" step is painful due to intermediate building. In a sloppy first-pass, it's pretty easy to just say "I'll build everything". The code is not too difficult: once the parts are linked, it's just a matter of taking second (or third) passes on those products to work down to raw materials. Unfortunately, it would be a massive waste of all this programmatic power to not allow for a little flexibility. The basic inspiration starts with EVEHQ's Prism tool. Build vs Buy cost for intermediates? Though the amateur or intermediate T2 manufacturer may just write off those functions as "too much trouble", I personally worry about these points and use them in my current production practices. Doing partial builds on components saves me character-days of otherwise wasted production time. Regardless of how I organize my tools, it will require 2 passes. First pass to list raw materials + intermediates, second pass to figure out additional raw materials. Though I can write some decision conditions to automate step-2, as a first draft I should stick to just processing it with expected human input. These views give me an intermediate point to deliver programming logic without the overhead of UI design. Also, it gives me a springboard to play with UI without having to completely redesign the code. Though I need to tweak the intermediate build step to be more intuitive, I think this is a pretty decent spot to start the next major leg of code development. I have spent much of the last week getting the pieces in order and starting work on actual EVE API code. The hope here is that I can load each contributor into the program and do the BPO math off their actual skills. 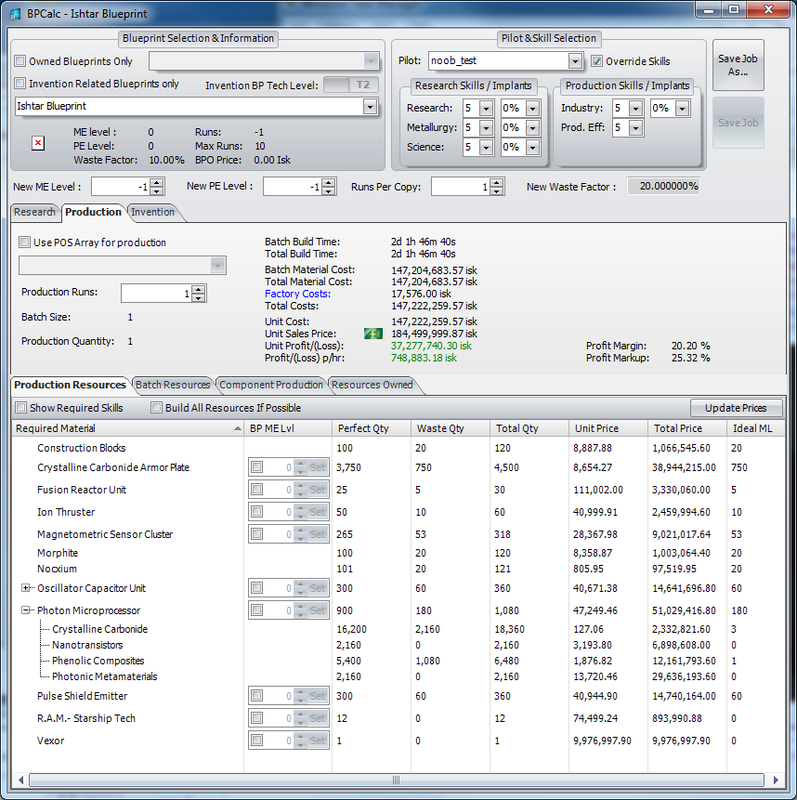 This will help define bill-of-materials on anyone, and better define costs on the other end. I recently teamed up with a friend from #tweetfleet to start focusing more completely on tool development. We're splitting the work up to finally solve some of the bottlenecks that have been holding me back from hiring help. The hope is, by spring, to have most of the alpha tools banged out so we can bring on players to help with the industry half while we work on more ambitious back-end work. It's gearing up to be a pretty epic year! Access to the application you were trying to use has been blocked in accordance with company policy. Please contact your system administrator if you believe this is in error. Nothing I can do to fix that. If pastebin is blocked at work, the iframes won't load. Somehow It's working now. Btw 'm looking forward to see more of your progress about T2 manufacturing. Also hoping EVE-HQ team to bring something more useful with their v3. It's getting harder for me to organize things day by day.